Shimokitazawa (下北沢) is a neighborhood in Tokyo’s Setagaya Ward and the subject of a short film I’m making that’s roughly a month away from being finished, one of the last pieces to complete The Tokyo Project. I had thought it might be ready about now, but since it’s coming a little later than planned I wanted to record a quick note regarding a big moment for Shimokita that transpired a few days ago. 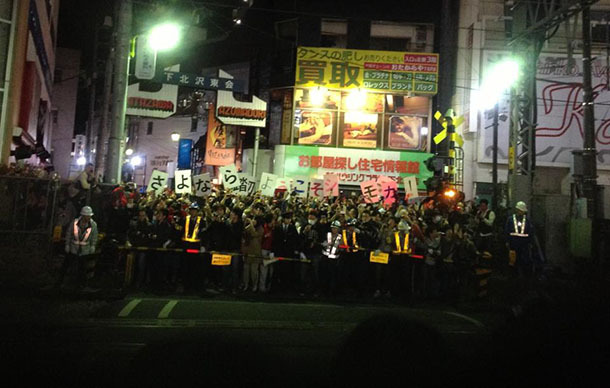 Friend, Shimokitazawa resident and community organizer Yurika Takahashi (@yurikacchi) helped keep me up-to-the-minute with events and provided all of the still photos included in this post. 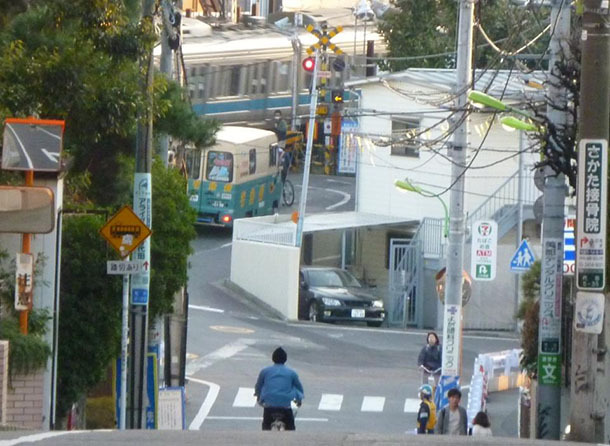 The grade level rail crossings (踏切 fumikiri) in Shimokitazawa predate World War II. They are iconic, inseparable parts of the community fabric. At least, they were until just after midnight on March 23, when the bells stopped and the gates lifted for the very last time. 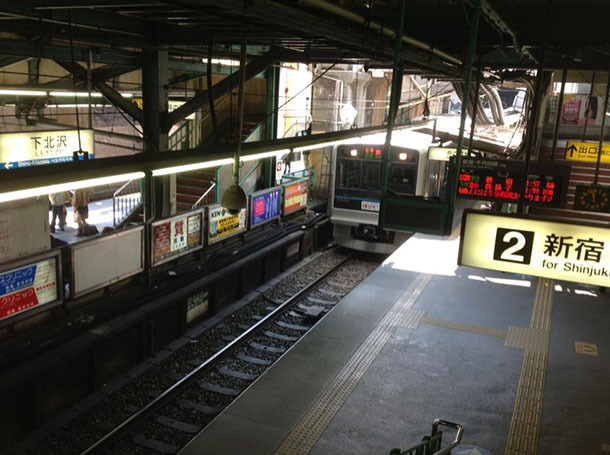 The following morning, The Odakyū Odawara Line switched to new underground tracks and platforms, and its fumikiri are already being dismantled. The tracks and gates bisected the neighborhood into north and south halves, each with lively but distinct atmospheres. 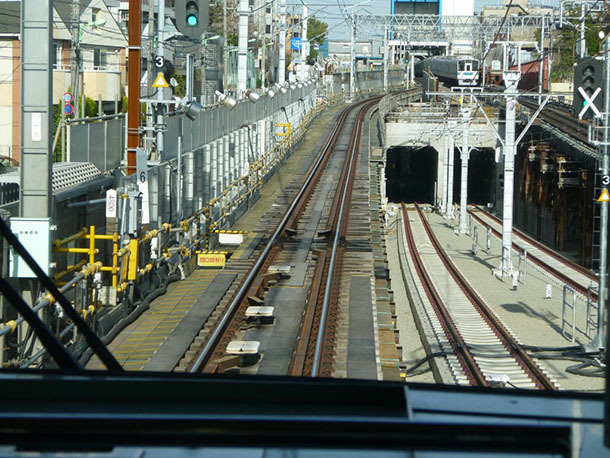 The cramped spaces created by all of the buildings shoehorned between the Odawara Line and intersecting Keio Inokashira Line, and the roundabout paths needed to thread through the multiple crossings are what give Shimokitazawa its unique layout and character. The change in hardware and pending redevelopment have far-reaching implications. I will go into detail about the background for all of this and the bigger picture of Shimokita when the film is ready, but events surrounding the transition are too notable to let pass without special mention. 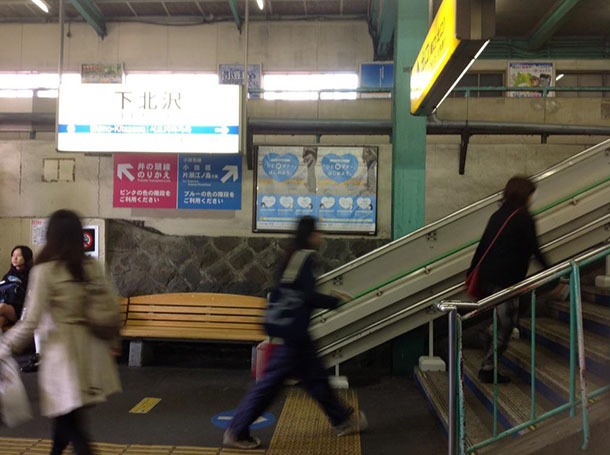 In Shimokitazawa there are several community groups engaged in dialog and activism regarding redevelopment, and one even sprung up recently to usher in the rail changeover, さよなら踏切！ようこそシモチカ！ or Good Bye Fumikiri! Welcome to Shimo-chika! (chika refers to subway or underground). This group became a conduit for the community to reflect on the role the train and crossings have played in the life of the neighborhood, for better and for worse. It gave many the opportunity to express thanks for fond memories of the past, while embracing the changes that are already in motion and those yet to come. You can check out the lively discussion on the group’s Facebook page. It’s a great example of how to do community engagement. 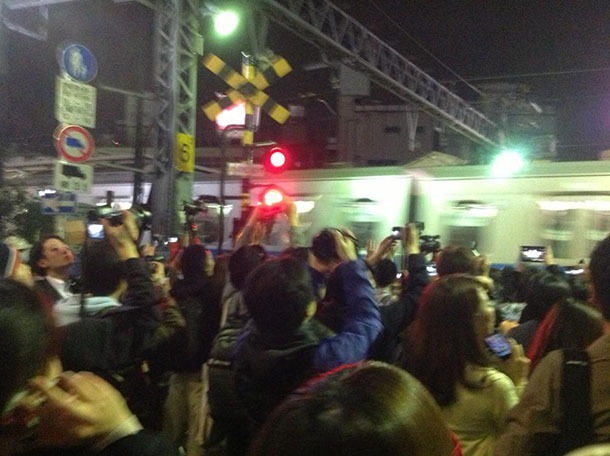 There is much yelling, hooting and hollering, but one repeated cry that comes through loud and clear is “Arigatō! 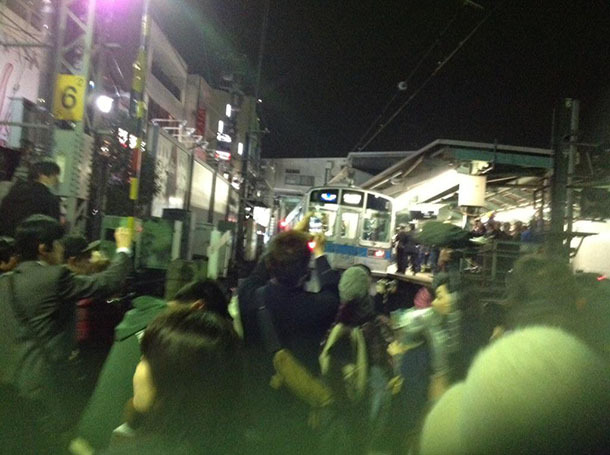 Arigatō gozaimasu!” When is the last time you held a street party to show your public transit how much you loved it? I found at least 30 of those. Probably many more out there. Safe to say this was important to them!